Race, racism, awareness of discrimination and privilege are subjects that we struggle with year in and year out. 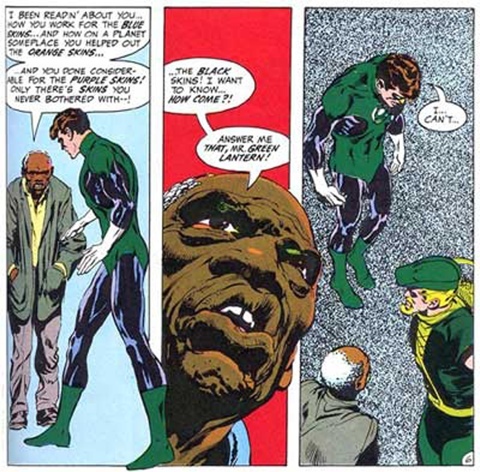 The reason that Green Lantern keeps becoming tied with race in comic books is that the nature of the story is that of an office which can be held by a person of any background. While Superman is one specific guy and Batman is one specific guy and Wonder Woman is one specific lady, Green Lantern rings have changed possession and ownership many times. 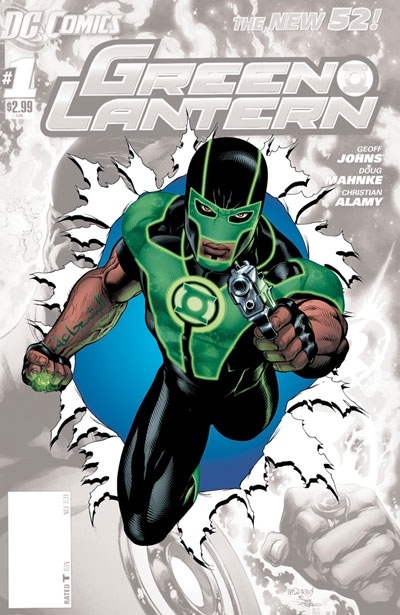 Why can’t there be (human) Green Lanterns of color? There was one, a John Stewart, best known in the Justice League animated series. Now there’s this fellow: a ski-mask wearing, nine-millimeter-brandishing, brown skinned Muslim. The only thing I can do is laugh and appreciate it. This is stupid. A very Bad Idea. Every bit as cringe-inducing as the old man and his “what of the black skins” speech. It’s offensive but in a toothless, braindense sort of way. It sees the criticism leveled at superhero comics’ spotty record on racial representation and tries to rectify the situation by playing up society’s broadest fears and stereotypes of brown-skinned men. It runs so assuredly into the wrong direction that a suspicion that the true intention was to provoke people like me (rather than include us) doesn’t seem unreasonable. I’m curious to check it out for the audacity of the thing. That’s one sale. Whether the comic can actually rise to the task of captivating my interest is a whole other story.